Rebekah Kirkland, 23, a Leicester College student who has recently completed her Level 3 in BTEC Fashion National Diploma created an amazing dress made out of nothing more than Walkers crisp packets. The dress went on to win this years, Leicester College Sustainable Design Award 2011. The dress was an excellent innovation of waste products used to create a functional garment. Sustainability Manager, Roy Morgan-Wood said “Leicester College is committed to embedding sustainable development in the fashion and footwear curriculum and thrives on innovative fashions. 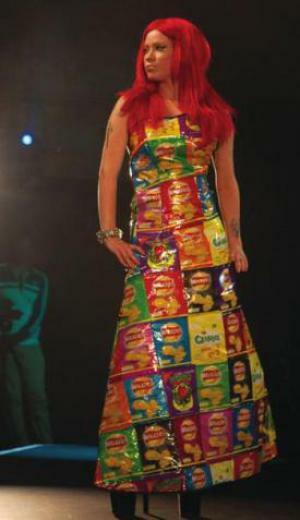 Having toyed with a number of brands Rebekah felt the striking and bold colours of Walkers crisp packets would create a dress exhibiting vibrancy, status and prominence. The dress itself took two months from conception to completion and was presented at the end of year fashion show. Rebekah added “Leicester College was always my first choice for learning about fashion. I am into recycling and reducing waste and thank Leicester College for helping me to achieve an amazing dress through everyday waste products”.